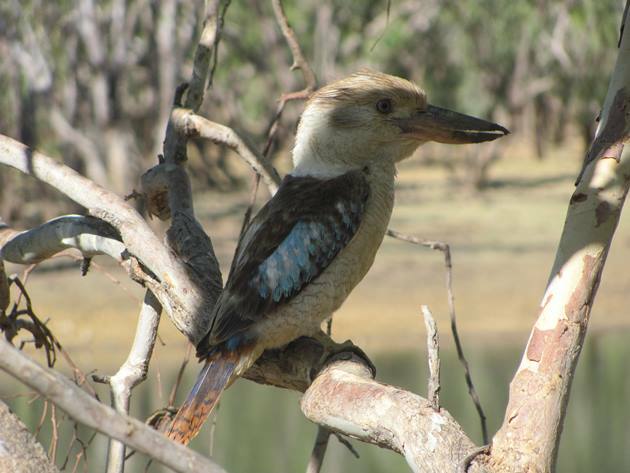 When we have camped at Ellendale Dam in the past we have invariable been woken by Blue-winged Kookaburras and they are often the last bird to call out as the sun drops below the horizon. 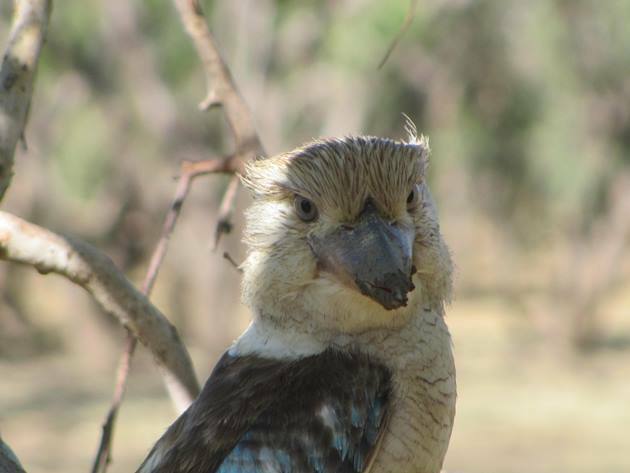 The call of the Blue-winged Kookaburra is not the laugh of the Laughing Kookaburra, but a more manic sound. In fact they may not even call at all and despite their size they may well be overlooked if they are sitting quietly in a tree. Quite often at home we likely overlook them if they don’t call out, but if they do call around sunrise you are guaranteed to wake up. Sitting on the banks of Ellendale Dam a Blue-winged Kookaburra landed in the tree beside us and swooped several times down into the mud looking for food. 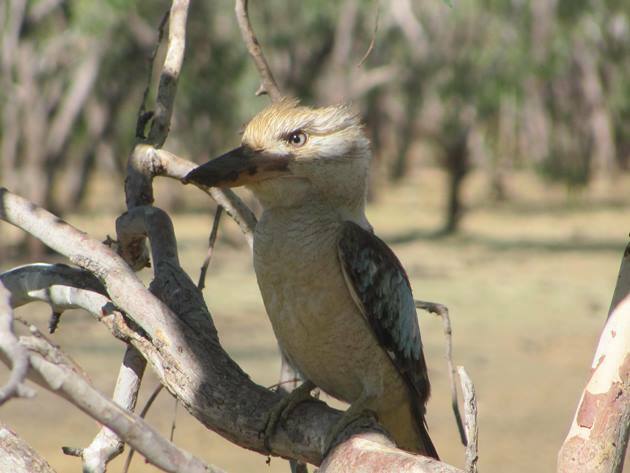 Blue-winged Kookaburras eat insects, reptiles and frogs and this bird would often collect quite a large mass of wet and muddy leaves with its food. It would then drop the muddy leaves and keep the food. The Blue-winged Kookaburra was not alone in the trees and we were quite surprised to see a Yellow-tinted Honeyeater take it on. 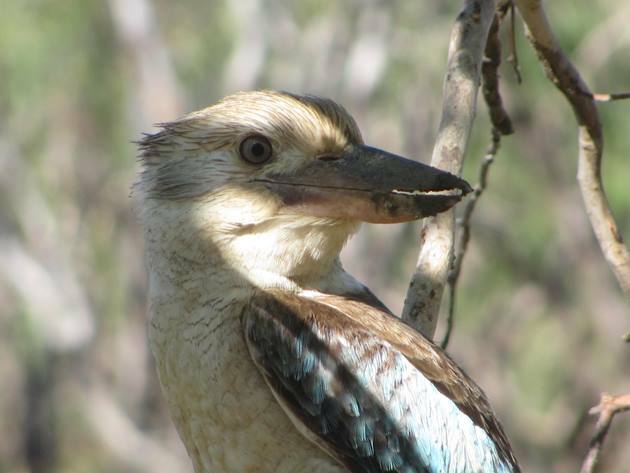 The Yellow-tinted Honeyeater was acting very aggressively towards the Blue-winged Kookaburra, but there was little reaction to the aggression. 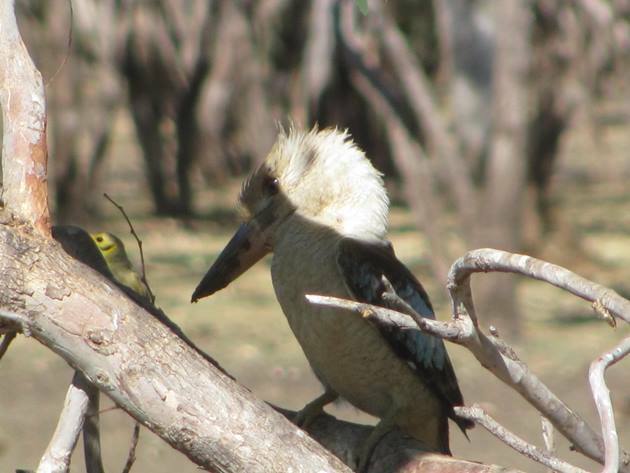 There were at least two Blue-winged Kookaburras feeding at Ellendale Dam last time we camped there. 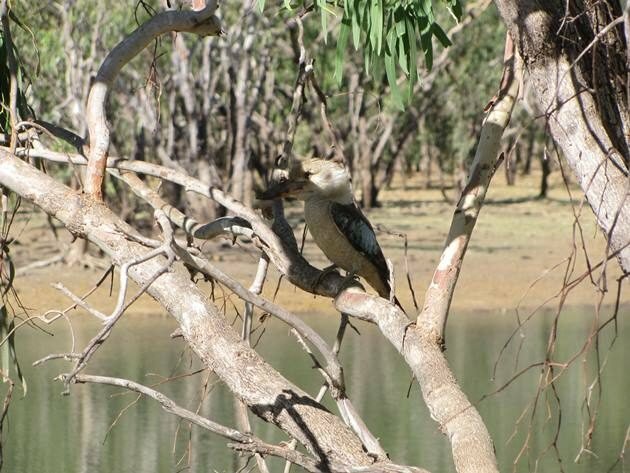 The Blue-winged Kookaburra has a very large bill and it is clear from the photos below it was getting quite muddy in the process of feeding on the edge of the dam. 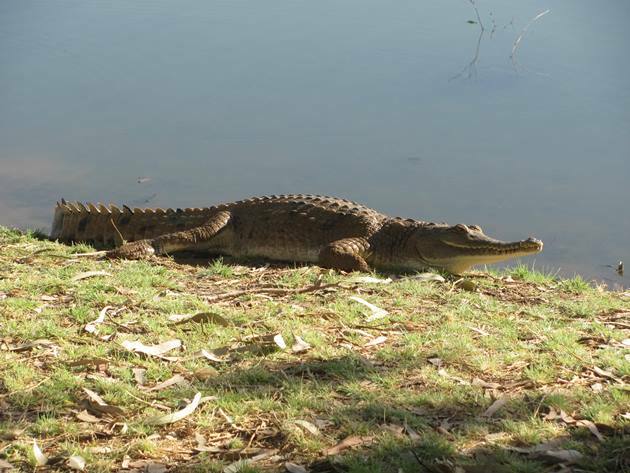 The other excitement at Ellendale Dam the past two years has been the arrival of at least one freshwater crocodile. 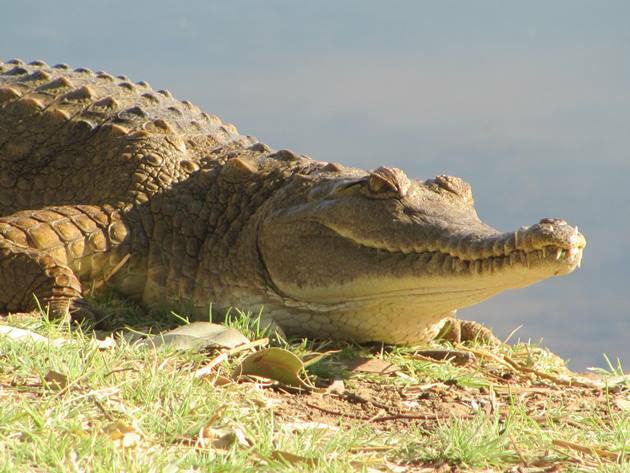 During the floods of the wetter months of the year where the dam became a mass of water with the main highway going through it the freshwater crocodiles moved in. During the day you can observe them in the dam or on the grassy banks. The bird-life does not appear to be too concerned about their presence. It is obviously advisable to keep a tidy and clean campsite so as not to attract them too close. There’s nothing like a bit of “danger” when you are camping in the bush! What a spectacular bird! I would have definitely kept a clean and tidy campsite with that crocodile nearby! Those birds are so cool. 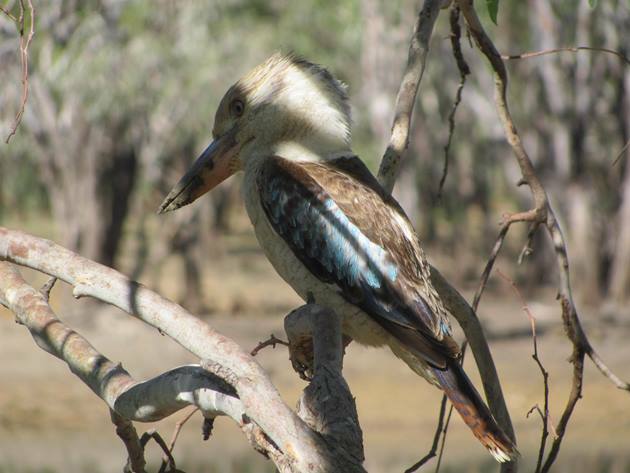 I got my first one at a park just before we entered Kakadu near Darwin, Those are some awesome photos as well! Yes, we agree….great birds and not always as vocal as you might think! It almost looks as if they stole their bill off a stork!